5. How to Get Rid of Dandruff? Amongst many skin problems, dandruff is the most common one that most of us have had some point in our life. This condition is harmless to our health, but it does damage to how we look in front of other people. Anyone who has their dandruff seen will somehow feel embarrassed and will try to figure out how to work this out. If you are looking for how to get rid of dandruff, you have come to the right place! This article is the only guide you’ll ever need! It covers the whole thing, from the most basic concept – what dandruff is, to the causes, how to get rid of dandruff efficiently and how to prevent dandruff from coming. Let’s find out! Dandruff is a common skin condition on your head where your skin is flaking and itchy. It is not a contagious disease nor does it affect your health. This condition is seen in men more than in women. And since it can be pretty embarrassing to have dandruff seen on your hair and shoulders, most people choose to use anti-dandruff shampoo. If you are still looking for the right shampoo, take a look at our article BEST DANDRUFF SHAMPOO FOR MEN, and you might find the answer! What are all the symptoms of dandruff, you might ask? Here is the answer for you! What does dandruff look like? It is white flakes on your head that come from your scalp. They are usually seen stuck on your hair and fallen on your shoulders. For some people, it will be accompanied by red and greasy skin. Dandruff is actually your dead skin coming off and it happens more in fall and winter when the weather is dry. Men are more prone to have dandruff than women, and people with oily hair also are more likely to have dandruff. Puberty can also be a phase where dandruff would develop. When you have dandruff, your scalp might feel dry and itchy. Should you have any doubts, it has nothing to do with poor hygiene, but the overgrowth of skin cells in your body. Before answering how to get rid of dandruff, it is necessary to find out the reason and mechanism of dandruff. Why does dandruff happen? WHY DO I HAVE SO MUCH DANDRUFF? When you have a better understanding of what leads to dandruff, you will be able to know what are the best ways to remove it. Unfortunately, the exact cause of dandruff is unidentified. However, there are many potential factors that could contribute to the development of dandruff . This strangely-named condition is a more serious form of dandruff. People with seborrheic dermatitis find their scalp red and itchy. It does not only happen in the scalp but also to other oily areas like the sides of the nose, around the eyebrows, or behind the ears. The skin will be red and oily, covered with scales of white or yellow. The situation can worsen to inflammation which can cause pain and swell to the people who have it. Seborrheic dermatitis often occurs in babies as well under the name “cradle cap”, and it is harmless and does not cause any itchiness or pain. It goes away on its own and it is advised that parents should not try to pick at the scales if they want to avoid infection. It is reported that common factors that can influence this disorder are environmental changes and stress. Dandruff is also known to be caused by a yeast-like fungus called Malassezia. This type of fungus needs fat to grow, so it develops based on our natural sebum and dead skin cells. Humidity is its favorable environment, so when we sweat in hot weather, it’s time for them to grow. When the fungus develops too rapidly, your body is unable to maintain its normal cell renewal process. It promotes the growth of excess skin cell, resulting in dandruff with itchiness. If you do not wash your hair enough, the oil and dead skin cells on the scalp will accumulate and cause dandruff. If this is the case, you might want to try to wash your hair more frequently. However, IS IT GOOD TO WASH YOUR HAIR EVERYDAY? Click on our article to know! One more reason that could lead to dandruff is the lack of hair brushing. When you do not comb your hair enough, dead skin cells will continue to build up making dandruff appear more. Combing your hair will help your skin to shed healthily and decrease the risk of dandruff. People with dry skin also are exposed to the risk of shedding scales. Dry skin equals dry scalp, so the flakes falling off will most likely be dry and not greasy like those of people with oily skin. There will probably be no redness and inflammation. However, having dry scalp does not mean you will have dandruff. WHAT’S THE DIFFERENCE BETWEEN DANDRUFF AND DRY SCALP? Click on our article to know! If you are having problem with dandruff, there is a chance you are not using the right type of hair products. Certain types can have components that trigger the itchiness. If you change shampoo and hair care products and you no longer have dandruff trouble, it is likely that your skin is sensitive towards the old type of hair care products. Those who that have eczema, a common skin condition that makes the patient’s skin dry, red, and itchy, are more prone to dandruff. Another skin condition is psoriasis, with which people will have red, flaky skin with skin patches covered with white scales. It is also more probable for people with Parkinson’s disease to get dandruff. People with other neurological problems and weaker immune system have a bigger potential of having dandruff. Currently, there is no absolute cure for dandruff. It can go away with the help of some methods presented below, so let’s take a look at our answer to “How to get rid of dandruff”! One of the most well-known ways to say goodbye to dandruff is to use anti-dandruff shampoo. If you have dandruff, getting a bottle of specialized shampoo will probably help you out. However, choosing the right type of hair wash that can rid you of dandruff is not always easy and you might have to try several brands or products before finding the perfect one for you . You may ask, when will they take effect? Find out the answer at HOW LONG DOES IT TAKE FOR DANDRUFF SHAMPOO TO WORK? Pyrithione zinc is a substance known to have antifungal and antibacterial properties. These shampoos can help eliminate the fungus that makes dandruff appear on your scalp. They could be your answers to how to get rid of dandruff! You can buy shampoos like Head & Shoulders or Jason Dandruff Relief, which contain pyrithione zinc. 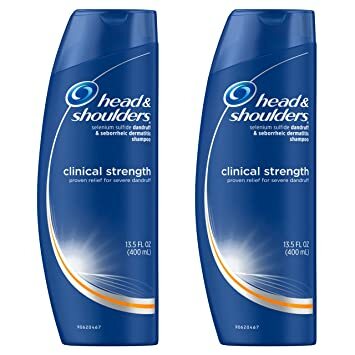 Head & Shoulders is an anti-dandruff and anti-seborrheic dermatitis shampoo that can relieve your itchy scalp and reduce flakes. You do not need a prescription for it. It is gentle to your skin and balance your skin pH but is widely recommended by dermatologists for its effectiveness. Even when it’s a gentle shampoo, is it safe for kids? Read more in our article IS HEAD AND SHOULDERS SAFE FOR KIDS? Coal tar is a by-product of the manufacture of coal. It works in reducing dandruff as it makes the top layer of the dead skin cells fall out and it also helps lower the growing speed of skin cells. However, shampoos that contain tar will most likely discolor your hair if it has light color, so you might want to be careful. One of the most famous tar-based shampoos is Neutrogena T/Gel. If you want to know how to get rid of dandruff, we recommend this one because it is effective from the first use. It can put itchiness, redness and flakes under control and the best thing about this shampoo is that even after you have rinsed it off with water the effect lasts for a long time! If your scalp is too scaly and greasy, shampoos containing salicylic acid is perfect for you! This type of shampoo removes excess scales on your scalp, but it should only be used by people with oily skin and hair because it has a drying property. People with dry skin may find more flakes on their hair. If it makes your skin dry and flaky, don’t worry. You only need to use moisturizers like hair conditioners to ease the dryness. 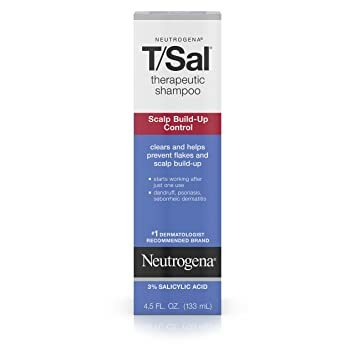 We recommend that you try out Neutrogena T/Sal, a therapeutic anti-dandruff shampoo. It has been reviewed to make your scalp clean and relieved after the first try. People have seen clear improvement where their scalp is not feeling itchy anymore and only after a couple of weeks, dandruff is hardly seen in their hair! In case you are diagnosed with dandruff caused by Malassezia, shampoo with selenium sulfide is your savior. Selenium sulfide will make the dying process of skin cells slower and kill Malassezia fungus. However, similar to shampoos with salicylic acid, these products can change the color of light-colored hair. The product we want to introduce to you is Selsun Blue. It is a combination of shampoo and hair conditioner, so it is not only the answer to how to get rid of dandruff, it also softens your hair and makes it healthier. Remember to rinse off thoroughly after applying! Ketoconazole is antifungal and shampoos with only 1% ketoconazole will help tremendously with dandruff outbreaks on your scalp. You can buy it over-the-counter as well as prescribed. 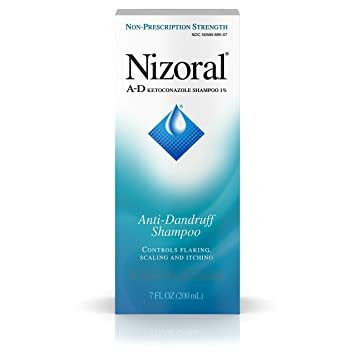 Nizoral is a typical ketoconazole shampoo and using this shampoo will control the number of flakes and itchiness. You only need to use this shampoo twice a week and will still get rid of dandruff. When it comes to home-based remedies, it should be easy to do and efficient. The below methods that we are introducing to you are both of those things! Don’t hesitate to try out so that you can share your experience on how to get rid of dandruff. When you are anxious or under pressure, you are likely to have worse dandruff. Stress weakens your immune system and fungus will have a chance to develop, causing more dandruff. What should you do to relieve stress? You should seek a way you can relax. Some people read, some people do exercises, and to each their own. One of many ways people find relaxing is doing yoga, which helps clear your mind and boost your health. Consider giving it a try! Tea tree oil is known to be antifungal, antibacterial and antiseptic. Even though some people have reported to not be the biggest fan of the smell of tea tree oil, it is an amazing treatment for dandruff cases. You can look for products that contain this agent to reduce dandruff on your scalp. Or you can choose to add only several drops of tea tree oil to your shampoo. Another tip on how to get rid of dandruff with tea tree oil is mixing one or two drops of it with a teaspoon of a diluting oil like coconut oil or olive oil. Next, apply to your hair and your scalp and only wash after half an hour or more. With this remedy, you only need to apply once to twice per week. Olive oil is a multifunctional essential oil, but it is mostly known for the ability to moisturize your skin and your hair. The dryness of your scalp can be eased when you use this natural moisturizer. You should use this method twice a week for healthy scalp and beautiful hair. To know more about how to get rid of dandruff with essential oils, take a look at ESSENTIAL OILS FOR DANDRUFF. Coconut oil is not only an excellent moisturizer, which can greatly reduce the itchiness, it is also antifungal, so it can eliminate fungus that causes dandruff on your scalp. You can follow this remedy twice a week for best results. Dandruff can be treated effectively and safely with apple cider vinegar, the most popular type of vinegar for natural health care. It can balance the pH level of your skin and prevent yeast from growing. Apple cider vinegar also cleans your hair and follicles. Repeat this remedy twice a week to have dandruff-free hair! Baking soda is in a lot of home-based recipes for natural treatment, and it can also help you in reducing dandruff. With its exfoliating property, baking soda makes dandruff disappear by removing dead skin cells and unwanted oil, inhibiting fungi growth. Note: Do not use shampoo after using this remedy. Use this treatment once to twice a week. Lemon juice is acidic and this can slay all the nasty fungi that can lead to the arrival of dandruff. If your scalp is itching, lemon juice will also relieve the itchiness and discomfort. It can easily be your solution to how to get rid of dandruff. Repeat this remedy several times a week. For a case of normal dandruff, you do not need to prepare for an appointment with your doctor. Many people with dandruff have treated it successfully with anti-dandruff shampoos and habitual changes. In case you have tried over-the-counter dandruff shampoos and home remedies effective for other people but you haven’t seen the expected results after a month, you might have a fungal infection or other skin disorder. Also, if your scalp is red and swollen, you should see your doctor. They can diagnose your situation and prescribe the appropriate medications on how to get rid of dandruff for you . If you are wondering, “so now I have learned how to get rid of dandruff, but I want to know when it will go away!” read our article HOW LONG DOES IT TAKE TO GET RID OF DANDRUFF to find out! Preparing is always easier than repairing. So how can dandruff be prevented? Here are 5 tips you can follow to keep dandruff at bay! Washing your hair frequently keeps it clean and prevents the risk of dandruff. When you wash your hair, you wash away the oil and dead skin cells accumulated on your scalp. If you have oily hair and are prone to dandruff, you might want to try shampooing every day to prevent dandruff. What is the right way to shampoo your hair? You should only gently massage your scalp and hair. Try not to scratch it too hard because it will damage your skin and increase the growth of bacteria. Before washing your hair, you should brush it to shed the dead skin cells. Chemical hair products like hair dye can be appealing, but they do damage to your hair and your scalp. There are good bacteria on your scalp that can fight yeast, and using chemicals will kill them, and you’ll end up having more dandruff. Say no to chemicals, and you might not have to look for how to get rid of dandruff anymore! Healthy skin starts within! What you eat will tremendously affect your health, that is, your skin and your hair. Foods that are rich in zinc, omega-3 fatty acids, B vitamins and selenium will help with your dandruff issue. Eat more of these beneficial foods! Exposing to sunlight is an easy remedy for many health conditions and it can surely help with treating dandruff. You are advised to spend some time each day under the sun. However, you should not sunbathe, because the over-exposure of sunlight can be a risk of skin cancer due to the ultraviolet rays. How to get rid of dandruff with sunlight? Our recommendation is to wear sunscreen and clothing that protect you from the sun rays and go out in the sun for only a short amount of time. Do not stand in the sunshine for more than a few minutes. Tricky! There are more than these 5 tips above to prevent dandruff. Want to learn more? Check out our the complete guide HOW TO PREVENT DANDRUFF! Now that we have shared with you all the tips, how to get rid of dandruff should not be a problem to you. If you are having dandruff, you can get anti-dandruff shampoos or try the home remedies we have suggested and see how it works. In case the dandruff issue stays persistent, you should ask your doctor for further treatment. It might indicate other health problems. If you find our information useful, hit LIKE and SHARE! Comment down below any of your questions and your opinion, we’d love to hear from you!